The brass and woodwinds played at the Easter Sunday services. Processional Hymn:: Cathy Moklebust version of Hymn #302, Jesus Christ is Risen Today with bells, choir. Combined Brass and Woodwind ensembles play at 8:25, 9;45, and 11:00 a.m. services. We will remain in the Sanctuary for the entire 8:25 and 11:00 a.m. services. Alleluia He Lives and Hallelujah Chorus are played only for the 8:30 and 11:00 a.m. services. 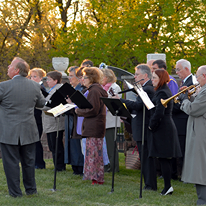 For the 9:45 a.m. service, we will only play the first piece, “Jesus Christ is Risen Today” with bells and choir. After that, move chairs and stands in next to the Communion railing, and leave the Sanctuary. Be back not later than 10:45 a.m. to warm up and be ready for the 11:00 a.m. service. Brass and woodwinds will sit at floor level in from of Chancel choir, woodwinds to the front. During communion, brass/woodwind ensembles move chairs, music stands and instruments in beside the railing to allow room for intinction communion. Suggested “uniform” for Easter Services is long sleeve, light-colored (e.g., white, yellow, powder blue) shirt with colorful Easter tie or scarf. But if you have another Easter outfit you really want to wear, that’s fine (but no t-shirts or shorts!!). Trumpet quartet: Suggest you bring a battery-operated stand light to the Sunrise Service, and clips or clear plastic laminate to keep your music in place (Hymn #’s 327 and 302 only). We will play on all three verses of both hymns. Descant on third/final verse.